posted: November 06, 2013 by: Ojai Village Veterinary Hospital Tags: "Clinic Specials" "News"
Ojai Village Veterinary Hospital continually researches and improves our services to ensure that we are offering the best medicine with state of the art equipment to treat your pets. The specific wavelengths of laser light energy interact with cells within the tissue to initiate processes that decrease pain, inflammation and edema. 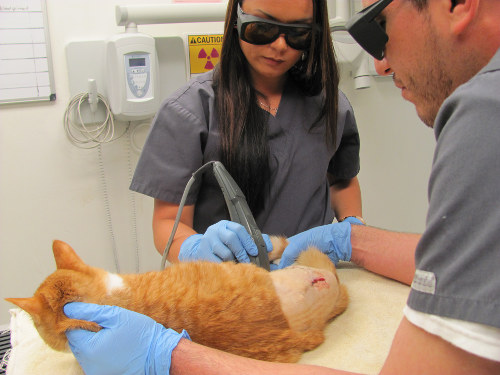 Your dog or cat can be treated with laser therapy at any age.